I have been using Hu Pharma's HGH for a little over a month now. 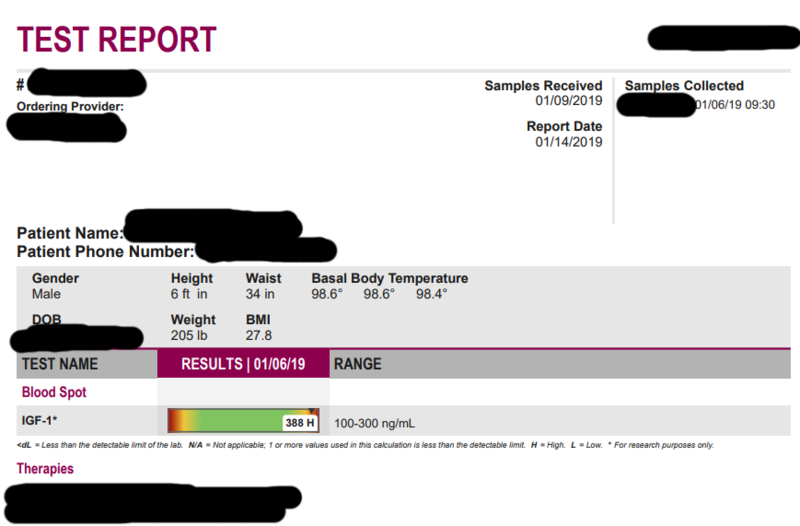 I pulled IGF-1 bloodwork at 5 weeks into using Hu Pharma's GMP black top kits. Prior to this I was using another sponsor for several months, This is still my first 'cycle' of HGH, but have been on for awhile now. The score below was taken fasted in the morning 3 hours after an injection of 2.5 IU. When I first switched to HU Pharma's GH, I was using 3.33 iu's however I found that I could not handle the side effects and tapered down to 2.5 iu's where I have remained until now, the side effects are still driving me nuts at this dosage. For specific details, please see my log in the HU Pharma forum. I have listed every supplement I take, every workout I do, and everything I eat in detail for full transparency. You can also see that I am taking 12.5mg of Aromasin E3D which can also affect IGF score. Overall... EXTREMELY happy with these results. A score of 388 IGF-1 with only taking 2.5 iu's daily while on AI! Last edited by leftkz; 01-15-2019 at 02:10 AM. Decided to try test base again today since this is my week 3 block of the program and it's a bench day. Pinned it into my right delt with a 5/8" 25G pin about 45mins before workout, went in smooth, stung a little bit yet again, but all good. I'm sad to say that I'm a bit disappointed by this test base. I'm not sure if it's the brand or if I don't react well to it, but I didn't really get anything out of it. Literally everyone I've talked to has told me the amazing pre-workout pump, aggression, strength you get from test base, but I just wasn't feeling anything... Maybe a little extra endurance? maybe placebo. I missed my rep goal on my top set of bench press by 1 rep. Was supposed to do 205x5, but was only able to crank out 4. Entire workout went pretty well, I like working out in a pretty fast pace. Still got GH sides continuing from my previous log posts. Hands are actually numb as I type this log right now. It's a bit annoying, but I think I can live with it for a bit. I'm trying a few solutions recommended to me by a few people. If all else fails, I will decrease dosage to 2 iu. Unfortunately, I will be ending the log here and not finishing out this specific cycle due to recent test results. For the time being, I will using a different brand of gear and may revisit HU Pharma when things are corrected. I will however post a new log in continuation of this bulk in the loggers forum. I would like to thank everyone for being so kind and helpful during my cycle. Thank you to HU Pharma for giving me the chance to log for you, even though it wasn't the results we expected, I am still grateful for the opportunity. I'm still new to this board, a month or so in, but I've found it to be very educational for topics I'm desiring more info on. I've followed your log since coming across it & have enjoyed your transparency, insight & knowledge. I'm sad to see ya have to end it but you did so politely & professionally. Thanks to you, and others like you who take the time to log every detail, Brothers like myself get to further our knowledge on things without having to ask uncomfortable questions or feel ignorant for not knowing what we don't know, if that even made sense. Lol. Anyway, thanks again Bro! Thank you for following along brother. I'm glad I was able to impact and help you in one way or another. Don't worry. I'm still a newbie myself. I don't know everything and I never will claim to, but this forum has a lot of great people that will help you. I've made a few very good friends from this forum that I can trust. These are people I have never met, and know only by their screen names, and yet some of them I trust more than people I know off this forum. 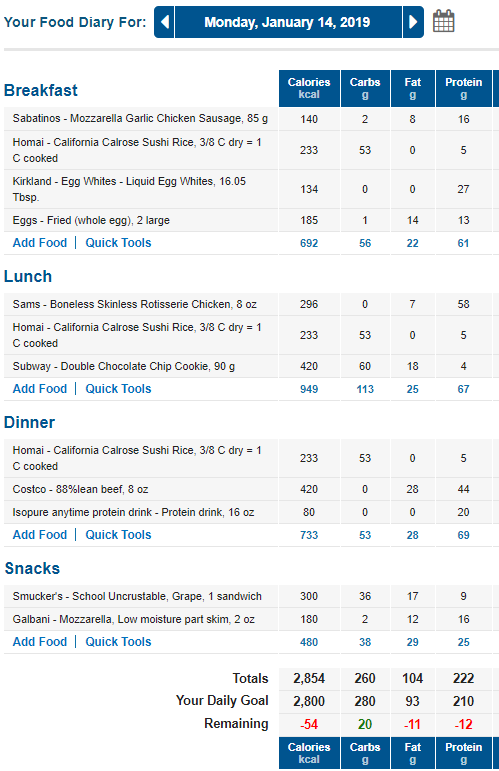 Lean bulking from 6.5% bf cycle?